Seventeen-year-old Ruby Thomas, newly responsible for her two young nieces after a devastating tragedy, is determined to keep her family safe in the vast, swirling world of 1920s New York City. She’s got street smarts, boundless determination, and one unusual skill: the ability to throw a ball as hard as the greatest pitchers in a baseball-mad city. From Coney Island sideshows to the brand-new Yankee Stadium, Diamond Ruby chronicles the extraordinary life and times of a girl who rises from utter poverty to the kind of renown only the Roaring Twenties can bestow. But her fame comes with a price, and Ruby must escape a deadly web of conspiracy and threats from Prohibition rumrunners, the Ku Klux Klan, and the gangster underworld. 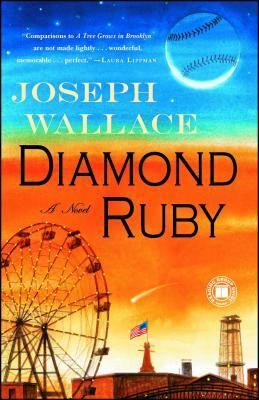 Diamond Ruby “is the exciting tale of a forgotten piece of baseball’s heritage, a girl who could throw with the best of them. A real page-turner, based closely on a true story” (Kevin Baker, author of Strivers Row). “Diamond Ruby is a gem! Moving, fascinating, and ultimately exhilarating.